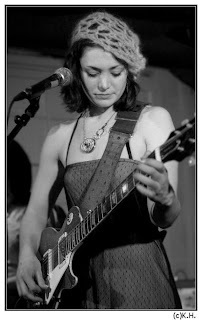 We recently met up with Carolynne McNeel, lead singer of the Rarebirds. (Philadelphia) Performing this Thursday, September 24th at JD McGillicuddy's Regina Spektor after-party featuring Rarebirds & Broken Prayers. Doors open 10:30pm, $5 admission, 421 N. 7th Street - between Spring Garden and Callowhill. MD: Tell us about your music. We sort of have a broad range - I generally categorize us as "bluesy indie rock," poppy at times, mellow and sort of country-ish at times. We'll go from really quiet to full-on rocking out, from one song to the next, or sometimes within a song. Yep, two albums: Flight Patterns (2005) [6 songs] and Burial at Sea (2007) [11 songs]. Hopefully we'll be recording our 3rd next year! Rarebirds hasn't really toured per se. We do out of town shows here and there, but we stick mostly to Philly (due to kids and jobs, etc). We did just recently play a really big outdoor amphitheater in Greensburg, PA (just outside of Pittsburgh), where we were treated like absolute rock stars, complete with signing autographs. That was a nice change from the bar scene in Philly (which I have no problem with either, just sometimes it's nice to branch out and play different sorts of venues and crowds). This summer we'll have played 5 different outdoor shows, ranging from quaint block parties to big festivals. MD: Tell us a little about the band. CM: Rarebirds formed in early 2004 after my old band April Disaster disbanded in 2003. 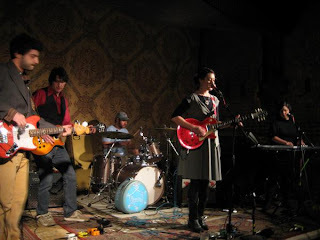 I took a brief stint at performing solo, and then as "the Carolynne McNeel Three," even after we started playing as a 4-piece, and the name was a misnomer. 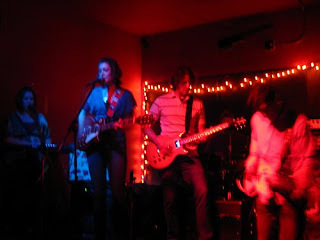 When we set to work on our first record during the summer-fall-winter of 2004 we decided it'd be a good time to give the band a proper name, so that's where Rarebirds came in. 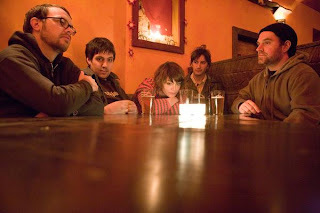 The band has a history of shared musicians from other local Philly bands. I started playing with Rory Connell (on guitar, sometimes bass) from Raccoon (which went on to become Dr. Dog, although Rory didn't continue on with Dr. Dog), and then with Dave Dworanczyk (Secession Movement), then Adam Herndon (Faux Slang, Run Runner, Barking Spiders, Elevator Parade, This Radiant Boy) joined the band playing bass. That was the line up for a couple years. Rory stepped down, and we introduced keys to the mix with Rick Hass (Faux Slang, Barking Spiders, This Radiant Boy) to fill out the sound. In 2006, Keith Forsythe who had just moved to Philly from North Carolina (where he had played mostly in metal bands!) joined on guitar. That year we began recording our 2nd record which we produced and recorded ourselves. It took about a year or so to finish. I don't remember exactly when, but Rick and Adam stepped down (probably some time in 2007). Each had many other obligations with different bands, jobs and getting masters/ doctorates. Adam stuck around and filled in when we needed a bass player, and we had Alex Yaker (Roomtone, Honey Church) who I also play with in Grammar Debate filling in on bass. 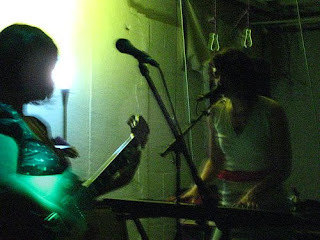 During that whole time (fall of '07), we started playing with Lara Manogg (the Lara and Joe Show, which is a children's music show, and Elastic Medium) on keys. Dave left the band, and in fall of 2008 we solidified our line-up with John Ziga on drums (whom I had played with in April Disaster... talk about coming full circle... he's also played in True if Destroyed, Rizzo Machine and Army of the Red Museum) and Ben Morgan on bass (Be Careful Little Hands, The Sand Family, Slipping Into Sublimnity, and Lexicon). You may also recognize him as MC Digga, the German rapper. Lara is actually pregnant at the moment (due early October), so Alex Yaker is going to be filling in on keys for a few months. MD: Do you have any other musical projects you're involved with right now? 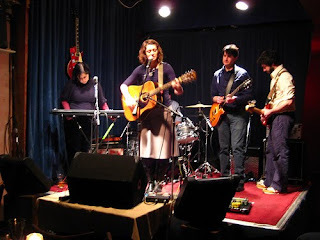 I've played with Grammar Debate for about 5 years now - I play violin, guitar, keys and vocals (mostly backing vocals). I also play with Roomtone on occasion (vocals and percussion) and I played in Ports of Call (which has since disbanded, earlier this year). Ben has his alter-ego, MC Digga where he's a German Rapper - it's actually pretty amazing to watch! 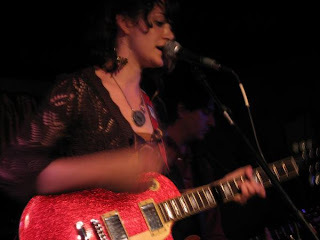 Lara currently plays in Elastic Medium and the Lara and Joe Show. John and Keith don't play in any other bands at this time (although I think John may be starting an all drum band with his 4 1/2 year old son). We mainly want to have fun and put out records that people like/ make them want to come out and see us play. We're happiest when we have a really good and receptive crowd. I'd much rather play to an empty room with like 2 people in it who are really enjoying themselves than a packed room at a club where people are just standing there not showing any emotion whatsoever. Of course I think we'd all love to be able to make a living doing this (wink wink- if anyone reading this interview wants to make that happen!) but at the same time we have a very realistic vision. MD: What are some of your interests (other than making music)? Well, I am immersed in the arts. I have Mew Gallery which is a full time job (minus the paycheck to go with it!... the bar job and teaching is what pays the bills) so I'm constantly running the show there with my partner Lauren. We do everything from housekeeping, to keeping the books, to promoting all of our artists endlessly. So my own art generally takes a back burner to that. But i am driven to create, so I usually end up staying awake till 4 am making jewelry and anything else, whether the medium is fabric and my tools are needles and sewing machines, or whether it's encaustic and wood and I'm working with my hot plate and heat gun. MD: Historic figure you'd like to have a drink with, given the chance? James Brown, Amelia Earhart, Elvis, Ray Charles, Lee Harvey Oswald. Anything with Bill Murray! Aside from that I don't really watch a whole lot of movies. I do love old Audrey Hepburn and Grace Kelly movies though, and Alfred Hitchcock.